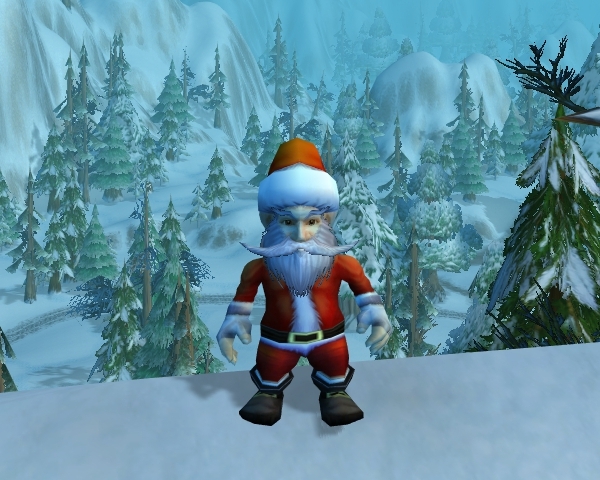 Winter Veil is the World of Warcraft counterpart of Christmas. It spans two weeks and a half at the end of December. The event is rich in festivities that culminate with the opening of the presents, on the 25th of December, under the Christmas Trees in Ironforge and Orgrimmar. Participation is open to everyone, but many parts require level 110 to complete. The event itself takes place in Ironforge or Orgrimmar, but also in Alterac Mountains and all capital cities (Alliance and Horde alike). Many rewards can be earned: pets, achievements, and many vanity items. 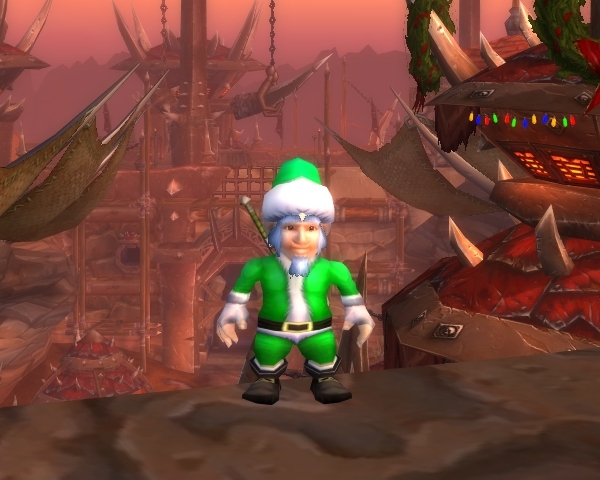 In 2018, the special gift of the event is a Toy Armor Set (Alliance) / Toy Armor Set (Horde). Getting this toy grants the new At Least You're Being Careful achievement. 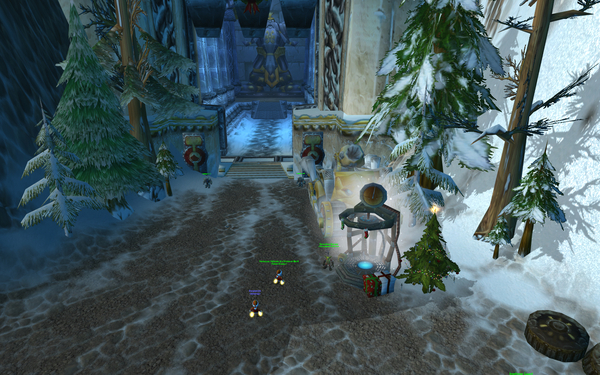 In addition, Miniature Winter Veil Tree had its item level updated to 335 this year. doing achievements not related to any of the 3 aforementioned activities. The event lasts two weeks and a half. It starts on the 16th of December at 10:00AM and ends on the 2nd of January at 6:00AM. Most of the achievements can be completed in a single day, but some can only be completed after opening the presents at the base of the Christmas Tree on the 25th of December. Lump of Coal is the only interesting reward that can take several days to obtain. Indeed, it is obtained from the daily quest but is not a guaranteed drop. 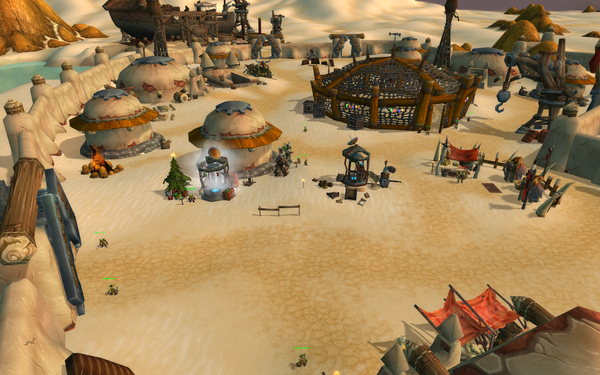 The main location of the event is in Ironforge and Orgrimmar, next to the bank. This is where you will find the Christmas Trees and most of the relevant NPCs (Great-Father Winter and the Smokywood Pastures vendors), although this is not where you will spend most of your time (as the event requires you to travel quite a bit). To complete the event, you will need to travel to many different locations, such as Alterac Mountains (where you will probably spend most of your time since the daily quest takes place there), your capital cities, the enemy capital cities, etc. To obtain all the achievements and have a chance to get all the interesting rewards, you will need to be level 85. That said, about half the achievements have no level requirements and can be obtained at low level. For opening all the Christmas presents, level 40 is required. At lower levels, some presents will not be available. 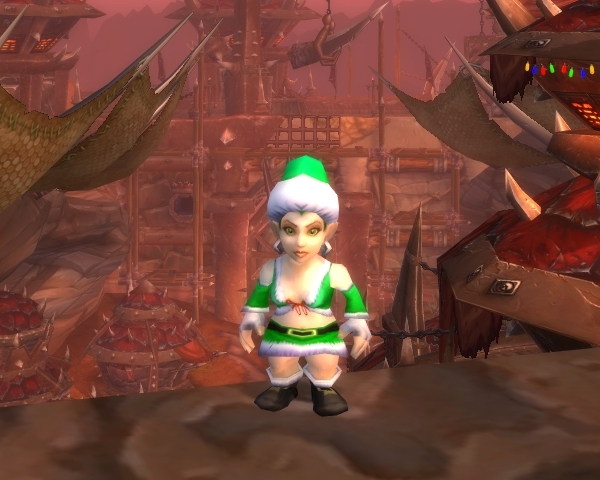 As with other events, Winter Veil offers a variety of rewards. 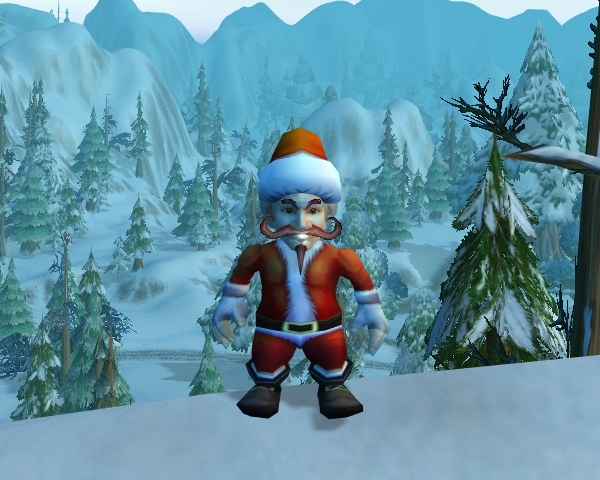 In the case of Winter Veil, most rewards have a chance to drop and have therefore no guarantee to be obtained by the end of the event. Mechanical Greench summons a mechanical pet that will help you in battle for 10 minutes. 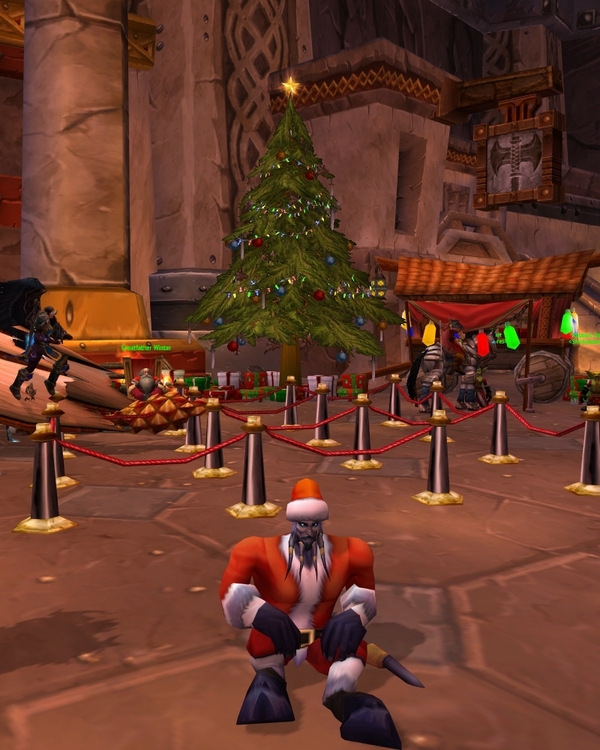 Preserved Holly makes your mount more festive. Both items have a chance to be obtained when opening the presents after the 25th of December. 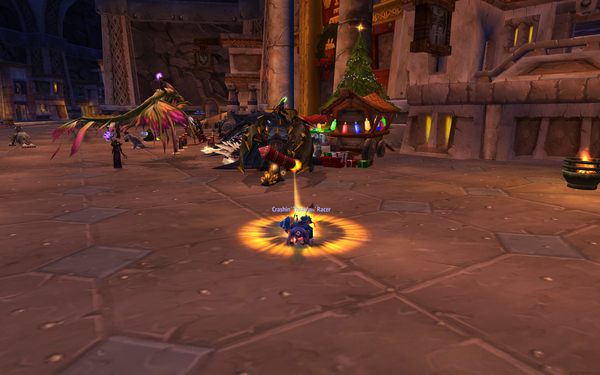 Wand of Holiday Cheer enables you to target an area and causes all players in this area to do the /lol emote. This item, which only works on players of your faction, has a 100% chance to be contained in one of the presents that appear after the 25th of December. "Merry Munchkin" Costume is a costume for your Perky Pug. It can be looted from Carefully Wrapped Present, one of the 25th of December presents. 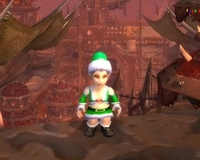 Note that Pattern: Red Winter Clothes (Alliance) or Pattern: Green Winter Clothes (Horde) will be mailed to you at the beginning of the Holiday, if you are a Tailor. The same applies for Leatherworkers and Pattern: Winter Boots. There are many toys that can be obtained during the event. 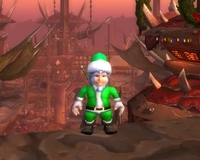 Toy Weapon Set (Alliance) and Toy Weapon Set (Horde) are guaranteed to be contained in the Winter Veil Gift from the 25th of December. Likewise, Greatfather Winter's Hearthstone is guaranteed to be contained in the Gently Shaken Gift. Hearthstation (Alliance) and Hearthstation (Horde) currently have no known source. Toy Weapon Set (Alliance) and Toy Weapon Set (Horde). In addition to Crashin' Thrashin' Flamer Controller, there are 4 other toy controllers that you can obtain to complete the Iron Armada achievement (see our section on this achievement): Crashin' Thrashin' Mortar Controller, Crashin' Thrashin' Roller Controller, Crashin' Thrashin' Cannon Controller, and Crashin' Thrashin' Killdozer Controller. 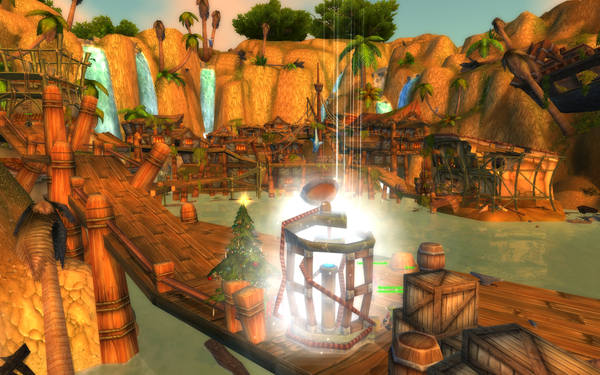 See our Garrison section to find out more about Merry Supplies. 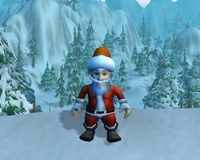 The outfits can be looted from the chest created by Disposable Winter Veil Suits. 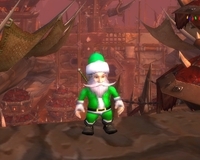 The hats cannot be looted from the chest and instead drop from Krosus in the Nighthold, Talixae Flamewreath in the Court of Stars, and Saprish in the Seat of the Triumvirate ( Finely-Tailored Red Holiday Hat) and from Illysana Ravencrest in Black Rook Hold, King Deepbeard in Eye of Azshara, and Varimatrhas in Antorus (WoWFinelyTailoredGreenHolidayHat). Minion of Grumpus has a chance to be contained in Savage Gift, which you can buy for 5 Merry Supplies from Izzy Hollyfizzle in your Garrison. 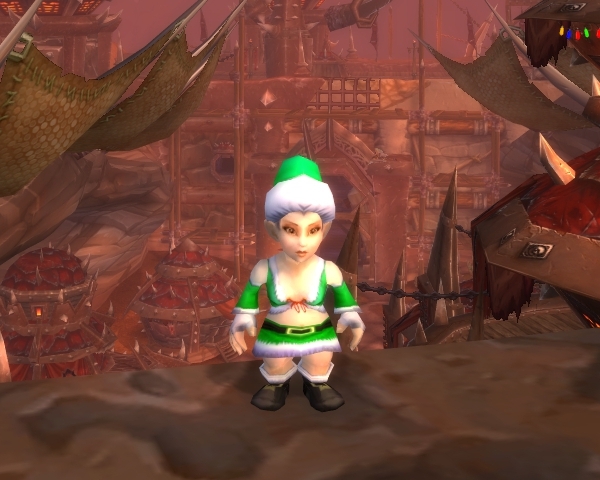 Miniature Winter Veil Tree is the only gear reward of the event. This 1.8 One-Hand Dagger for Rogues has a chance to be obtained every time you complete the daily quest. The meta-achievement of the event is Merrymaker. It counts towards What a Long, Strange Trip It's Been and rewards the Merrymaker title. For Alliance players, the initial quest for the event is Greatfather Winter is Here!. 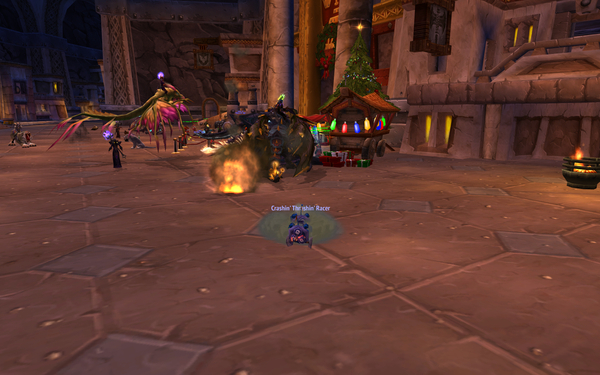 This quest is given by Wulmort Jinglepocket in Ironforge (next to the bank) and is turned in to Greatfather Winter who is sitting next to the quest giver. You can also get this quest from Smokywood Pastures in every major city. 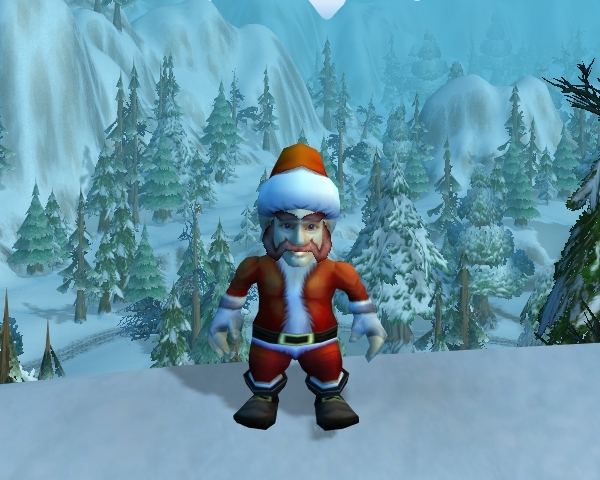 For Horde players, the initial quest for the event is Great-father Winter is Here!. This quest is given by Kaymard Copperpinch in Orgrimmar (next to the bank) and is turned in to Great-father Winter who is sitting next to the quest giver. The follow-up quest is Treats for Greatfather Winter for Alliance players or Treats for Great-father Winter for Horde players. Note that this is not technically a follow-up quest as you do not need to have completed the first quest to obtain it, but it makes sense to do Greatfather Winter is Here! or Great-father Winter is Here! first. You will need to bring 5 Gingerbread Cookies and 1 glass of Ice Cold Milk to Greatfather Winter (Alliance) or Great-father Winter (Horde). 5x Small Egg: these items will probably go for a very high price on the Auction House during Winter Veil, so you might want to farm them in Tanaris or Eversong Woods. 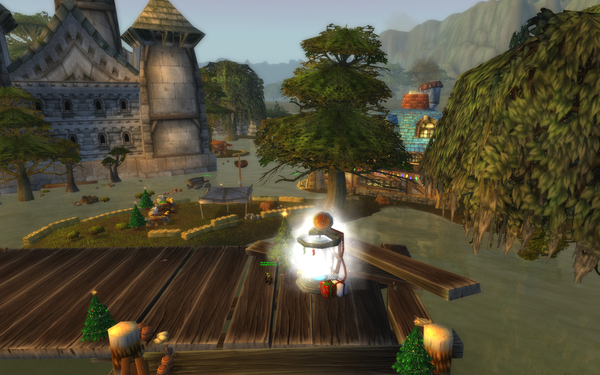 5x Holiday Spices: these can be bought from the nearby Smokywood Pastures vendor. Completing this follow-up quest will reward you with Smokywood Pastures Gift Pack, which has always contained low level crafting materials. 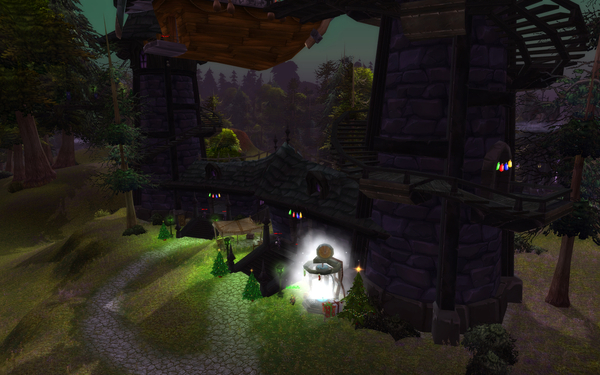 A few hours later, you will be mailed a Smokywood Pastures Sampler, which contains holiday food and Graccu's Mince Meat Fruitcakes (that you need for the 'Tis the Season achievement). Next to the event location, you can take the The Reason for the Season (Alliance / Horde) quest given by Goli Krumn in Ironforge and Furmund in Orgrimmar. Completing the quest will give you The Feast of Winter Veil, a book that contains valuable lore information about the event. You also get a follow-up quest, The Feast of Winter Veil (Alliance / Horde), which requires you to bring the book to Muradin Bronzebeard in Ironforge or Baine Bloodhoof in Thunder Buff. 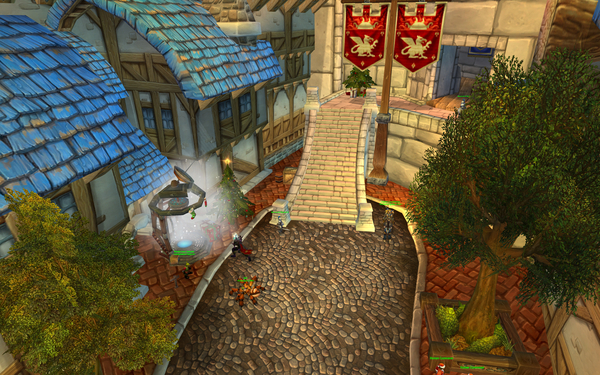 Note that the Smokywood Pastures vendors are never hostile even when located in an enemy city. Therefore, Alliance players can obtain Pattern: Green Winter Clothes and Horde players can obtain Pattern: Red Winter Clothes, provided that they manage to survive long enough to buy the item. Once you have a complete set, equip it and eat a Graccu's Mince Meat Fruitcake. This will grant you the achievement. 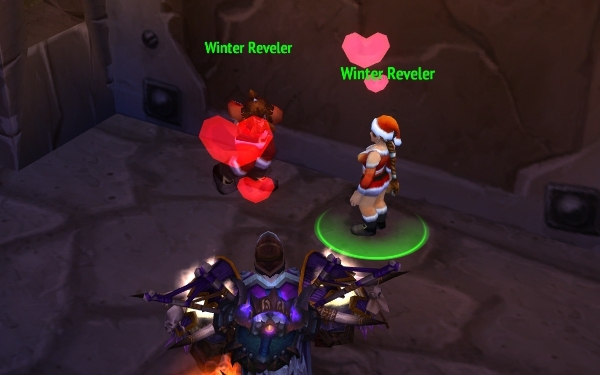 In this section, we detail the 3 achievements linked to kissing Revelers: Fa-la-la-la-Ogri'la, Let It Snow, and Bros. Before Ho Ho Ho's (Alliance/Horde). Fa-la-la-la-Ogri'la requires you to use Fresh Holly or Preserved Holly while on the Bomb Them Again! 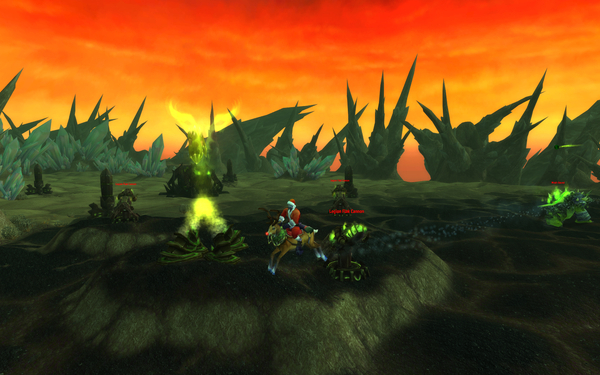 daily quest in Blade's Edge Mountains. Upon completing the quest, you will be granted the achievement. 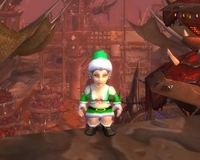 Note that, in addition to having the chance to be contained in one of the presents on the 25th of December, Preserved Holly can also be obtained by completing the The Hero of the Day (Alliance / Horde) quest during Winter Veil (at the event location in Ironforge or Orgrimmar). This will require you to turn in a Deeprock Salt. To complete Bros. Before Ho Ho Ho's (Alliance/Horde), Alliance players will need to obtain 8 pieces of Mistletoe while Horde players will only need 3. 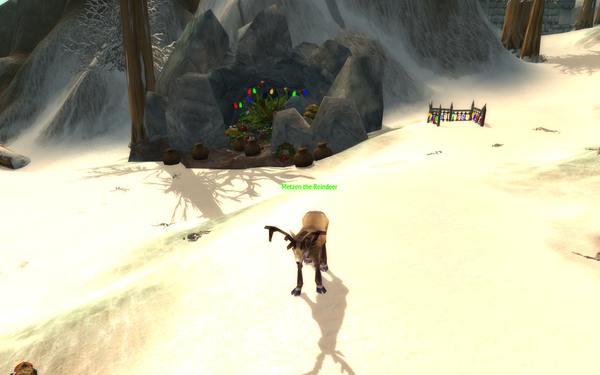 Then, players need to visit NPCs and use the Mistletoe on them. If you have completed the Theramore scenario, then you will need to speak to Zidormi at the western end of the west bridge of Theramore. 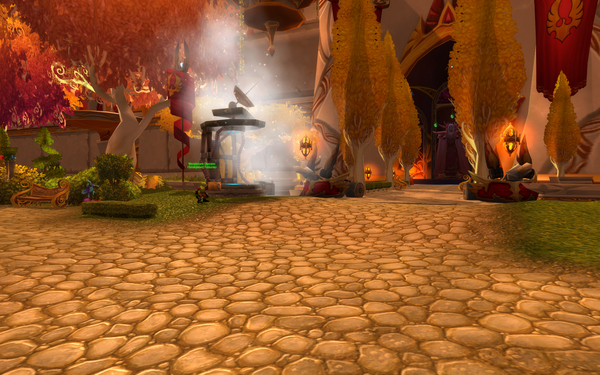 She will transport you to Past Theramore where you will be able to interact with Karman. 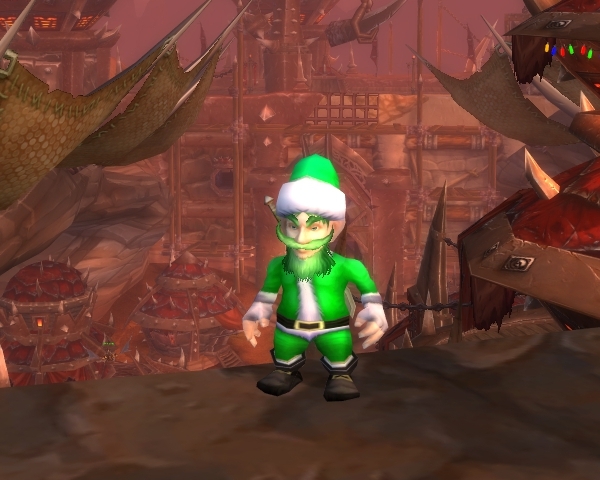 You're a Mean One... (Alliance / Horde) is the only daily quest of the event. 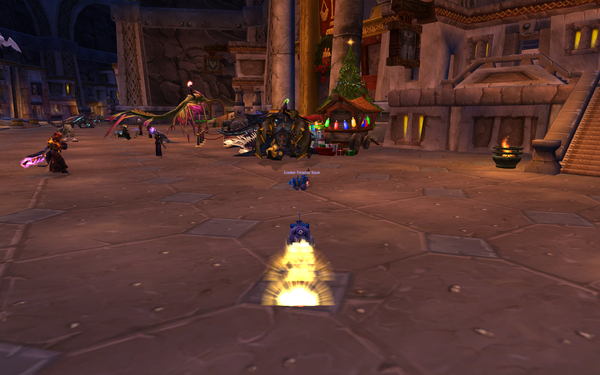 It is given to you by Wulmort Jinglepocket in Ironforge and Kaymard Copperpinch in Orgrimmar. This quest is a group quest, in the same model as the Threat From Above (Alliance / Horde) daily group quest from the Argent Tournament, where groups had to fight to be the first to tag Chillmaw as soon as it respawned. Here, the mob to kill is The Abominable Greench who is located at the Growless Cave in the Alterac Mountains (south of the Ruins of Alterac). The Abominable Greench has 3.4M health and has only one attack of concern that he uses regularly to jump on a player, damaging all the players in the area and throwing them in the air. It is advised to have a group consisting of at least 1 tank, 1 healer, and 1 dps. Tiny Green Ragdoll (toy, also sold by vendors). In addition, approximately one day after completing the quest, you will receive a Winter Veil Disguise Kit in the mail. This item is required for the A Frosty Shake achievement. 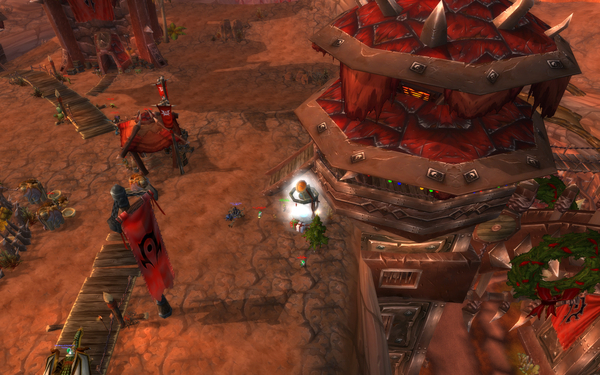 This achievement will be automatically completed the first time you do You're a Mean One... (Alliance / Horde). This achievement will be automatically completed when you hand in Greatfather Winter (Alliance) or Great-father Winter (Horde). After receiving your Winter Veil Disguise Kit in the mail, you will be able to complete the A Frosty Shake achievement. To do so, travel to Dalaran with a friend who also has the disguise. There, the both of you will need to use your disguises and then dance with each other, by typing /dance while targeting the other. If you must go alone, then you will probably find someone with a disguise to dance with. by using your Snowmaster 9000, if you are an engineer. To complete this achievement, you must obtain a Gaudy Winter Veil Sweater, which you have a chance of finding in each Stolen Present. 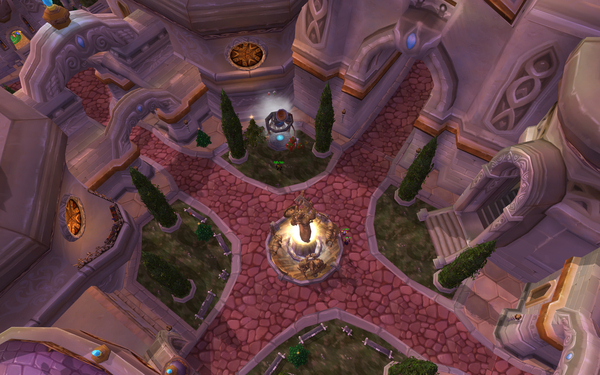 Once you have the sweater, you should use it in each of the 4 enemy capital cities to earn the A-Caroling We Will Go (Alliance/Horde) achievement. A good idea is to do this achievement at the same time as BB King (Alliance/Horde), as it will also require you to travel to enemy capital cities. Note that if you want to get rid of the Gaudy Winter Veil Sweater, you can have it refunded for 5 by completing the Thanks, But No Thanks (Alliance / Horde) quest. This loot table is updated for 2018. Carefully Wrapped Present Holiday Food, Warm Red Woolen Socks, Warm Blue Woolen Socks, Warm Green Woolen Socks, and "Merry Munchkin" Costume. The presents remain under the tree until the 2nd of January. There are two achievements related to this 25th of December event. Opening all the presents will automatically grant you the He Knows If You've Been Naughty achievement. This achievement requires a Crashin' Thrashin' Flyer Controller. You can use the flyer (an airplane) that is summoned by the item to shoot down other players' flyers. To do so, simply be in the vicinity of another flyer and use the first ability of your flyer (automatically bound to "1"). Each time you use this ability, your flyer will deal some damage to the other flyer, and after a few attacks, you the other flyer will be destroyed and you will gain the The Danger Zone achievement. The second ability of your flyer (bound to "2") gives it a speed boost, although this will probably not be necessary. While you can try to find other players using flyers in the proximity of the Christmas Tree, or you can just ask a friend to help you out. Savage Gift: to spend your Merry Supplies after you bought all the other rewards. Can contain Minion of Grumpus, a mount. 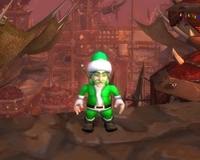 There are 6 achievements that are not connected to any other part of Winter Veil: BB King (Alliance/Horde), Crashin' & Thrashin', Scrooge (Alliance/Horde), The Winter Veil Gourmet, With a Little Helper from My Friends, Iron Armada. We will detail them below. 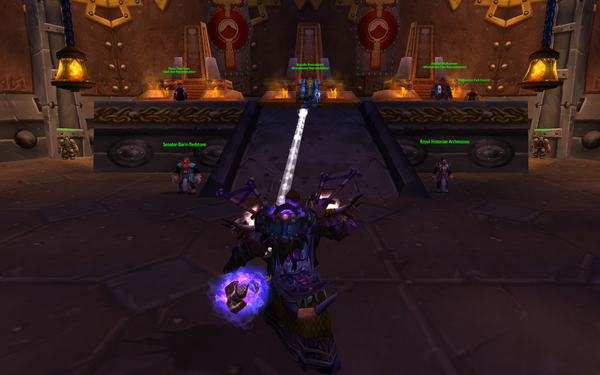 First, the BB King (Alliance/Horde) achievement requires you to obtain a Red Rider Air Rifle. This item is sold by Craggle Wobbletop in Stormwind City, Blax Bottlerocket in Orgrimmar, and Clockwork Assistant and Jepetto Joybuzz in Dalaran. Second, you need to use the rifle on each of the 4 leaders of the ennemy faction. Typically, there will be a lot of groups advertising in trade for this achievement and you should try to join one of them. You might also earn the For The Alliance! or For The Horde! achievement as a result. Note that if you are ready to do a lot of corpse running, it is possible to earn the achievement with a level 1 character. A good idea is to postpone doing this achievement until after the 25th of December, so that you can do it at the same time as A-Caroling We Will Go (Alliance/Horde). First, the Crashin' & Thrashin' achievement requires you to obtain a Blue Crashin' Thrashin' Racer Controller. This item is sold by Craggle Wobbletop in Stormwind City, Blax Bottlerocket in Orgrimmar, and Clockwork Assistant and Jepetto Joybuzz in Dalaran. Second, you need to find a spot where other players are using their racers. 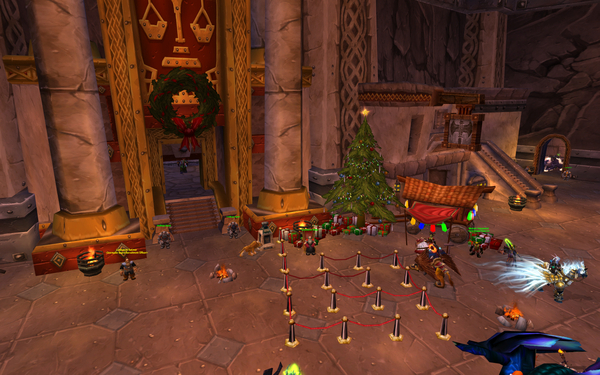 This will typically be the area around the Christmas Tree in Ironforge or Orgrimmar. You can also earn the achievement with the help of a friend. Third, use your Blue Crashin' Thrashin' Racer Controller. This will enable you to pilot your racer. It has only one ability, Racer Rocket Slam, which you need to use in order to crash into other players' racers. After 25 crashes, you will earn the achievement. 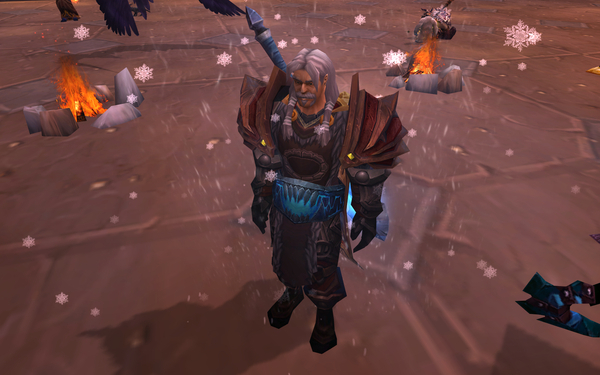 For completing the Scrooge (Alliance/Horde) achievement, you need to throw a Snowball at Muradin Bronzebeard (in the throne room in Ironforge) if you play Alliance, or at Baine Bloodhoof (in Thunder Bluff) if you play Horde. Note that if you have completed the introductory quests, they you will have already cooked Gingerbread Cookies. To complete the With a Little Helper from My Friends achievement, you need to find a Winter Wondervolt machine in one of your capital cities. They are usually located next to the Flight Master. Once you have the buff, you need to kill 50 players from the opposite faction. Note that if you die, you will lose the buff and will have to go back to the machine to refresh it. 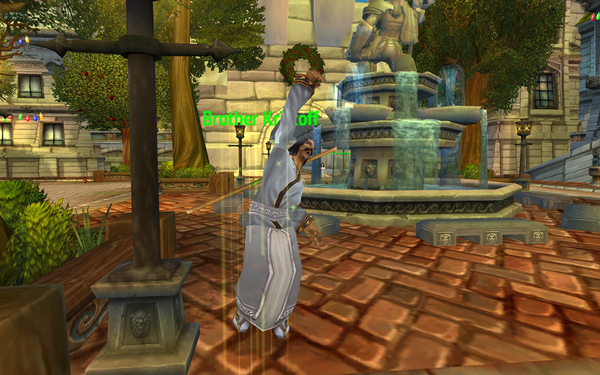 The buff is also removed when shape-shifting, which is bad news for Druids. Losing the buff does not reset your kill count. A good place to gather these kills is the Isle of Conquest. 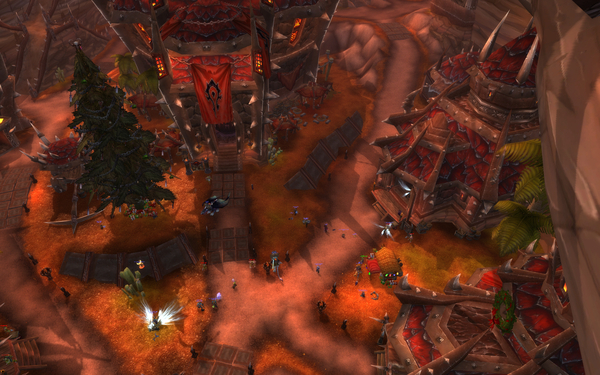 Simply queue for this Battleground and stick with your group. 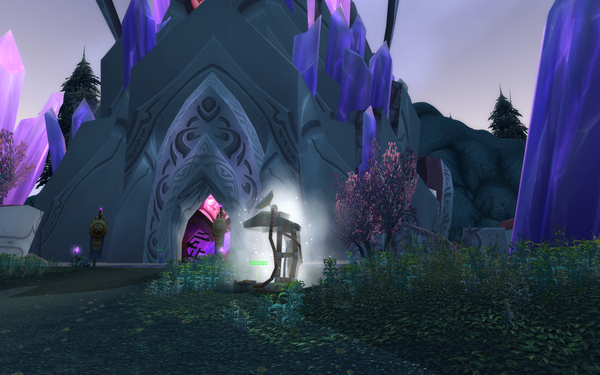 Crashin' Thrashin' Mortar Controller is dropped by Smashum Grabb, near the Dark Portal in Tanaan Jungle. 26 Dec. 2018: Greatfather Winter's Hearthstone update. 17 Dec. 2018: 2018 update. 18 Dec. 2017: 2017 update. 26 Dec. 2016: 25th of December loot update. 16 Dec. 2016: Updated for 2016. 25 Dec. 2015: Red Wooden Sled turned out to be contained in the Gently Shaken Gift. 16 Dec. 2015: Updated for 2015. 16 Dec. 2014: Updated for 2014. 29 Dec. 2013: Made a small update regarding the 2013 special present and related achievement. 16 Dec. 2013: Updated for 2013 and fixed a few very minor errors reported on the forums.